After last week’s free hand embroidery pattern and the online resource for the old book it came from, I received a slew of email with several questions pertaining to that article. They were mostly pertinent enough to combine into an article on Old Embroidery Books Online, which, as today’s title suggests, is exactly what I’m doing. If you’re not into old books, I won’t hold it against you! But I am a Strangely Passionate Old Book Fiend (“old” modifying “book” in that phrase, please). Ok, come to think of it, I’m a Strangely Passionate Book Fiend, whether old or new. But, like I said, if you’re not into books, feel free to pass by me today, because that’s what I’m going to talk about. We can resume our relationship tomorrow, right where we left off! Now, by old embroidery books, I mean books published anywhere from about the 1970’s, backwards – pretty much anything “before my time.” I think they attract me because they are before my time. But I seem to lean towards “the older, the better.” This isn’t exactly the case in every book instance, though, because there are some old embroidery books that I can easily give a miss, and there are some newer embroidery books that I’d turn summersaults for. I collect old embroidery books and old embroidery pamphlets and periodicals. But I only collect them occasionally. If I buy one online, it’s because I already know what it is, and I’m looking for it specifically. When I come across one in a used book shop, estate sale, antique shop, or what-have-you, and it is a book that I would really be interested in, and the price is right, then I buy it. But I don’t just buy up any old books – I try to be discerning in the books I collect. Some questions that came up: How does an old book come to my attention, and how do I know to look for it, and where do I look for it? First, there’s this matter of reading. I actually do read the books in my needlework library, and in them – especially in anything that’s historically based – there are usually references to other books or authors. These references often intrigue me, and they lead me down various paths of exploration. 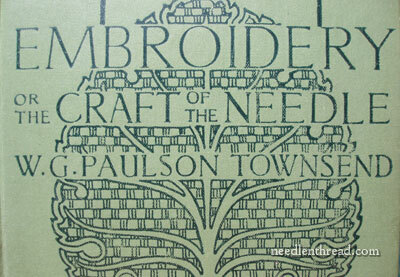 I also tend to look for books by specific authors or by people notable in any given era of embroidery. Mrs. Archibald Christie comes to mind. 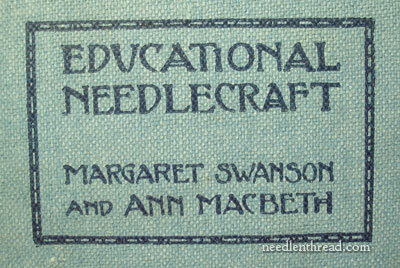 She wrote many excellent books on embroidery in the early 1900’s. (Samplers and Stitches is one of my favorites.) Once I had made Mrs. Christie’s acquaintance, it was easy to look for her hither and yon, and I generally keep an eye out for her at the various book haunts. I’ve collected several of her books for my own shelf, and I’ve also come across many of her works free, online. I’ve also visited the rare books rooms at libraries to view certain of her books and other authors’ books. For example, the Topeka Public Library has a rare copy of Christie’s English Medieval Embroidery, which I’ve perused a few times. I don’t own my own copy of it, but I’d like to. The $2,000+ price tag is (needless to say) quite prohibitive! Besides exploring references and looking for specific authors, I look for books by era. For example, the Arts & Crafts Movement intrigues me, so I tend to seek out information or read a lot about that era. My interests also tend to cross other fields of study, and because I have an interest, for example, in the Oxford Movement, in World War I poetry, in Renaissance music, in medieval illumination, and whatnot, I tend to find the art and needlework of the same eras more intriguing, too. I explore those interests and come across the names of the “movers and shakers” in the various fields of art, and this all leads to the discovery of old needlework books. Old needlework periodicals are a little bit different. I know they exist, but my favorite ones are from France, from the mid 1800’s through the mid 1900’s. Sometimes, it’s hard to get my fingers on them. I generally search for those by the name of the publication, like La Brodeuse or La Broderie Blanche or Journal des Demoiselles or Sajou. In English, the Carmela Testa Variety publications from the early 1900’s and the various journals like the Needlecraft Practical Journal and Weldon’s, are all favorites. I keep up an ongoing search for these types of publications through used book sources and through eBay. The other overwhelming question was concerning recommendations for finding free online embroidery books. Internet Archive and Project Gutenberg both have excellent search features. If you type “embroidery” into their search field, you’ll come up with some real treasures! It sometimes take a lot of browsing to find books that particularly interest you, and you can narrow your search by adding other words, like “embroidery design” or “embroidery Christie” or “Jacobean embroidery” and so forth. The Digital Archives on Weaving, etc. and Antique Pattern Library don’t have the same type of search feature, but if you go to the “books” page on Digital Archives or the “catalog” page on Antique Pattern Library, you can use your keyboard commands to search the listings. Just click control+F on a PC or command+F on a Mac, and a little search box will show up at the top of your browser. There, you can type in keywords, like “embroidery” and search the listings that way. 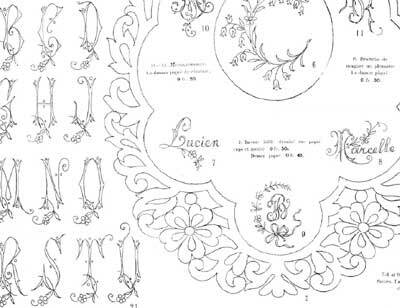 For Sajou and similar embroidery pamphlets, the best online source is Patternmaker, a blog devoted to making these old publications available. 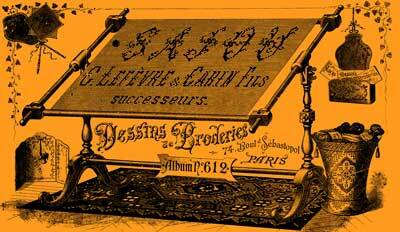 There, you’ll find many (if not all) of the old Sajou alphabet pamphlets, as well as many Russian and German pamphlets. It’s an excellent collection and well worth a browse. And finally, the other questions I received concerning old books had to do with designs in particular. Why do I bother doing a line drawing of a design that’s available in a free online book? Fair question – because it’s easier for you (and me) to print it and use it; because my copy is cleaner and will take a lot less printer ink; and because my copy can be easily enlarged or reduced without losing resolution. How do you make those line drawings and can you provide a tutorial for making them? I use Adobe Illustrator or Inkscape to create vector drawings. You can look up either of these online (Inkscape if free shareware) and there are many, many tutorials online for how they work. You can also take classes to learn these things. It would be very difficult for me to offer tutorials for using them, because it would open up too many questions, especially from those not already familiar with graphics and design, that I don’t have time to answer and that are not the focus of Needle ‘n Thread. Aren’t you violating copyright by putting that design on your website? No. It’s in the public domain. Someone else has already put it online in their own digital file, so isn’t that a violation of their copyright rights? No. The design is in the public domain. Why do you have a copyright on the design if it is from an old book? The copyright is on my digital version, not on the design itself. It simply means you can’t take my digital version and sell it or publish it on another website, etc., without my permission. There you have it. All Old Embroidery Book Related Questions answered for this week! If you have any further questions, don’t hesitate to ask! You can leave a comment below, or you can drop me a line. I’m more likely to answer your question right away if you leave it below, and other people can benefit from your questions, too, when they are left on the website. Old embroidery books are right up my bookshelf! An adapted saying ‘Don’t throw out your old embroidery magazines or sell your old books, just buy another bookcase.’ In my case it might be more appropriate to say ‘…just add on another room’ ! Thank you for todays info. Cheers, Kath. Mary, I am looking for an old embroidery book that sounds delightful. It was a tool for teaching girls to embroidery. The author is Ethel R. Hambridge and the book title is “The Story of Girlie Bunting on the Island of “Never-Mind-Where””. I found a copy at amazon.com.co.uk for $31, but when I went back to order it, it had been sold. If you run across an archived copy, please let me know. Thanks! illustrations and look forward to searching the sources you have posted. And to Linda Hayes-Trent : there is one used copy of ‘The Story of Girlie Bunting’ listed at abebooks.com, that may be what you are seeking. Thanks, Green Heron! I purchased the copy of Girlie Bunting from AbeBooks and am looking forward to receiving it. I am am an avid craft book fan like yourself, and came across an old advertisement for the Girlie Bunting book when I was browsing the Internet Archive. The book sounds alot like the ‘Mary Frances’ book series, have you heard of them? Anyway, I was wondering, if it were possible, for you to put a copy of the book on the Internet Archive, if you have access to a scanner? If not I understand. I’d love to have a review of the book though, it sounds utterly charming. You had me going there for a few minutes. “Mrs. Archibald Christie” was the famed Agatha Christie’s first married name, having married Col. Archibald Christie. I figured you’d have mentioned the fact, but I checked the list of her published books to make sure I hadn’t missed anything. Found only several sour critiques citing her “embroidered” plots! Mary, you have opened many windows of new learning for me. I am now retired and am so thankful I have the time and resources for learning and creating. Thank you so much and please do not stop what you are doing!! Ah, someone with the same passion. I love the Patternmaker website and have devoted countless hours to it’s existence. If you are looking for Sajou alphabet patterns for doing monograms and such, then Patternmaker is excellent. The internet archive does take some searching and patience. For those who do fine crochet it is the best resource for old crochet patterns. This link will explain the missing letters Bev. I just googled ‘Alphabet missing letters’ as knew about them but didn’t feel I could explain. Thanks for the link, Kath! That’s a good point, especially when dealing with ancient alphabets. In olden days, printing and graphic design was not quite as easy and accessible as today, so certain shortcuts can be made with the alphabet. For example, an M can serve as a W – just flip it over. An “I” can serve as a “J” (this is also a linguistic consideration, kind of similar to the article in the link Kath posted). Last names beginning with certain letters are also not common in some languages, so the infrequent use of the letters in names was a sufficient excuse to exclude the letters from monogram alphabets. Have to agree about Grace Christie. However another of my Favourites is Louisa Pesel. I thoroughly enjoy receiving your emails and this latest one re Samplers and Stitches by Mrs. Archibald Christie is no exception. In fact, I have found a few of these books in the UK and have purchased one for myself. The details are just devine and I am looking forward to receiving it so can pour over the pages and try not to drool 🙂 You are so kind to share all of your secrets with us. Also, the needle ID cards are fantastic! So many books and very little time left. Thank you, thank you. I was about to buy a copy of ‘Samplers and Stitches’ but your comprehensive list of free sources led me straight to it. I need the answer to a very important question: where do you get the time and energy to do all that you do? And could I have just a little of them please? In the absence of that I will continue reading your post every day and learning and when I grow up I might just be nearly as good as you. Yes, the love of “Old” books. Last week I purchased one I had been watching for over a year. The price had been coming down and finally – it was within reach. I grabbed it and love it. It is a collection of full sized Ecclesiastical embroidery plates taken from actual items. One draw back is that the pages are so very fragile. It must be used with the greatest care, but the information contained there in – it’s priceless! The sites are a bit difficult to navigate at first, but there are gems to be found amongst the tangle. All I can say, Mary, if I ever find out where you live, I’m popping in to see your collections. If only. Don’t worry, I live in New Jersey and don’t travel at all. People hear “embroidery” and they say “oh — embroidery”. What they don’t realize, poor little things, is that “embroidery” encompasses books, antiques, materials, threads, patterns, history, color, art, beauty. Oh well, they just don’t get it. THANK YOU AGAIN. How many times can I thank you? I have slowly come to the realization that I am a collector of embroidery books, most especially those with stitch directions. I know most of them overlap but there are many many stitches out there that are rarely seen. Like you, I read all my needlework books cover to cover. For me it’s not just all about the pictures – I need to absorb the information too. Thanks for this post! I wondered if you knew of anyone who might be collecting Embroidery magazine. I have about 15 copies from the early 1980’s looking for a home if there is one! I have found a book soulmate! I have never really run into someone that collects sewing books like I do. Not only on embroidery, but general sewing, and quilting. I have stacks of back issues of magazines, full bookcases, and can’t stop, well when I am broke like now I tend to stop. My collecting goes through every era up to the present, but I have found as I come across books, I’m much more discerning now than I used to be. You can many times give a more recent book a pass just because of who the publisher was. 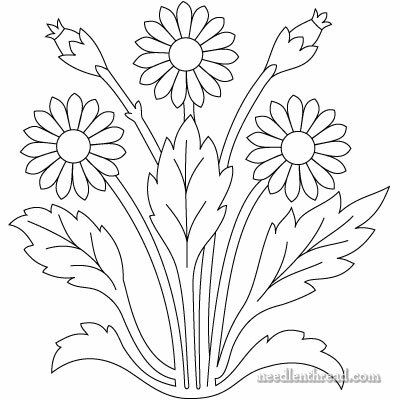 I do want to mention that in your’s and other’s searches for embroidery ideas, many of the older general sewing books have chapters on embroidery and designs so don’t pass them up until you have had a chance to check out those chapters. 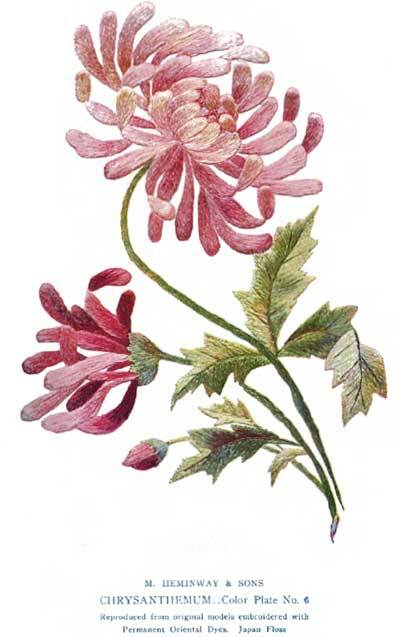 So many aspects of needlwork overlap such as embroidery that can become a form of lace making. Just so glad to have found your site and thank you for the ideas on who to look for. One on my list is Mary Brooks Picken, not so much for embroidery but anything she wrote is marvelous. She helped teach thousands of women how to sew via correspondence classes back in the first half of the 1900’s. I’m disabled with bad arthritis and I find reading about any form of needlework or looking at my magazines helps take my mind off of my pain. I also started a sewing related business on line of selling sewing patterns, and still have much to list although we have over 8000 patterns up for sell at this point. Maybe then I will get to the booklets and leaflets I have set aside to sale. Always too much to do, but rather that than be bored! So my life is surrounded with needle and thread! I found your site via Pinterest by the way. to purchase another… Any idea of the author? Hi, Mary. Please provide as much information as you can on the alphabet (i.e., was it a hippy font, did it have swirls, flowers, etc.). I am searching. If I find anything close to that author’s name, I’ll let you know. Good luck on your hunt! I have a copy of “Simple Stitch patterns for embroidery” by Anne Brandon-Jones published by B.T. Batsford. The preface is dated May 1926 but I can’t find a date of publication, how can I find out if it has a value?